Available in a variety of sizes, these Le Chef grey chef trousers are hard wearing and long lasting with a laundry proof zip fly. 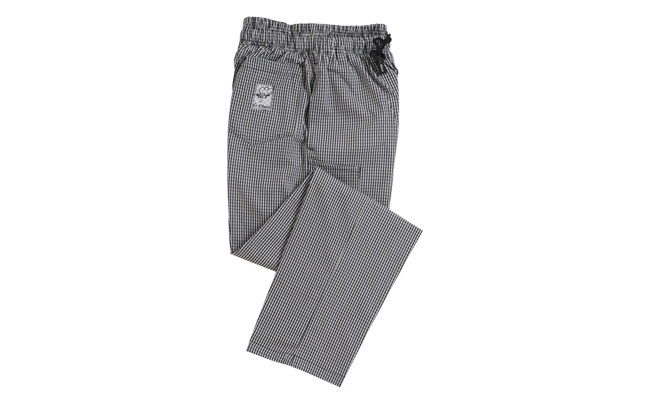 These unisex and multifit grey chef trousers are bleach resistant and can be easily cleaned in a 65°C industrial wash. For a professional and smart look, these comfortable grey chef trousers have a self-locking drawstring with two side pockets, one phone pocket and one hip pocket for protection in the kitchen. Made from 35% cotton and 65% polyester. Discover our extensive range of chef clothing here at Pattersons Catering Supplies and find more chef's wear to complete your look, such as chef jackets and shoes. If you have any questions about our grey chef trousers or a general question about any of Pattersons Catering Supplies, call the customer services team on 0117 934 1270 or drop us an email at web@pattersons.co.uk.